TORONTO, June 10, 2016 - As the Canadian economy contends with softer than expected exports, weak business investment and effects of the Alberta wildfires, real GDP growth in 2016 is forecast to be 1.4 per cent, according to the latest RBC Economics Outlook report. A decline of 1.0 per cent (annualized) in the second quarter will pose a setback, although the contraction is expected to be brief. RBC Economics anticipates that a recovery in oil production and rebuilding in fire-ravaged northern Alberta, along with a probable rise in exports, will boost growth in the second half of the year. Third-quarter real GDP growth is forecast at 4.0 per cent, slowing to 2.1 per cent in the fourth quarter. “This erratic roller coaster of economic activity means the Canadian economy is headed for another year of moderate growth,” said Craig Wright, senior vice-president and chief economist at RBC. “Canadian consumers are propelling the domestic economy, with auto and home sales at record or near-record levels, and at this point their debt loads appear to be manageable,” Wright said. The oil-producing provinces of Alberta, Saskatchewan and Newfoundland and Labrador are still feeling the pinch of reduced business and consumer spending. “It’s no surprise that energy companies continue to cut back, but a recent Statistics Canada survey on capital expenditures showed that companies outside the energy industry also plan to invest less this year, and that’s cause for concern,” said Wright. Given the near-term volatility in the Canadian economy, the Bank of Canada will likely keep the overnight rate at 0.5 per cent for the rest of 2016. RBC Economics forecasts the Canadian economy will expand by 2.0 per cent next year as higher oil prices spur an increase in business investment. Oil prices brushed the $50/barrel level in late May and early June, thanks to falling U.S. production combined with temporary production outages in Canada and some emerging economies. The Canadian dollar mirrored the second-quarter jump in oil prices, rallying more than eight U.S. cents from its January low of 68 U.S. cents. RBC Economics anticipates that oil prices will continue to rise in 2017 and the Bank of Canada will be in position to increase the overnight rate, both positive factors for the currency. The Canadian dollar is forecast to end 2017 at 80 U.S. cents. Ongoing adjustments to lower energy oil prices will continue to result in a marked divergence in provincial growth rates in 2016 with a trio of oil-producing provinces (Alberta, Saskatchewan, Newfoundland & Labrador) contracting further and a trio of oil-consuming provinces (British Columbia, Ontario and Manitoba) seeing material growth. RBC Economics in fact raised its 2016 GDP growth forecasts for Ontario and B.C. On the other hand, it lowered its forecasts for Alberta and Saskatchewan in light of persistent weakness in capital spending in the energy sector, and in the case of Alberta, due to the significant disruptions caused by the wildfires. U.S. economic data pointed to a sharp upswing in April, with U.S. home sales running at the fastest pace since late 2007 and exports growing at the fastest pace in six months. U.S. consumers have the firepower to spend, backed by stronger wage increases and tighter labour market conditions. “The U.S. economy is rebounding from a couple of weak quarters while the weakening in the pace of employment growth is expected to prove short-lived setting up for market participants to become more confident of a Federal Reserve interest rate hike,” Wright said. The global economy is forecast to grow by 3.1 per cent this year. Low energy prices and interest rates should enable most of the advanced economies to accelerate in 2016 while emerging market economies will see more subdued economic activity. In China, the changing composition in the drivers of growth resulted in a pullback in Chinese demand for imports that is acting as a headwind for other emerging economies that export to China. A complete copy of the RBC Economic and Financial Market Outlook is available online as of 7 a.m. ET. 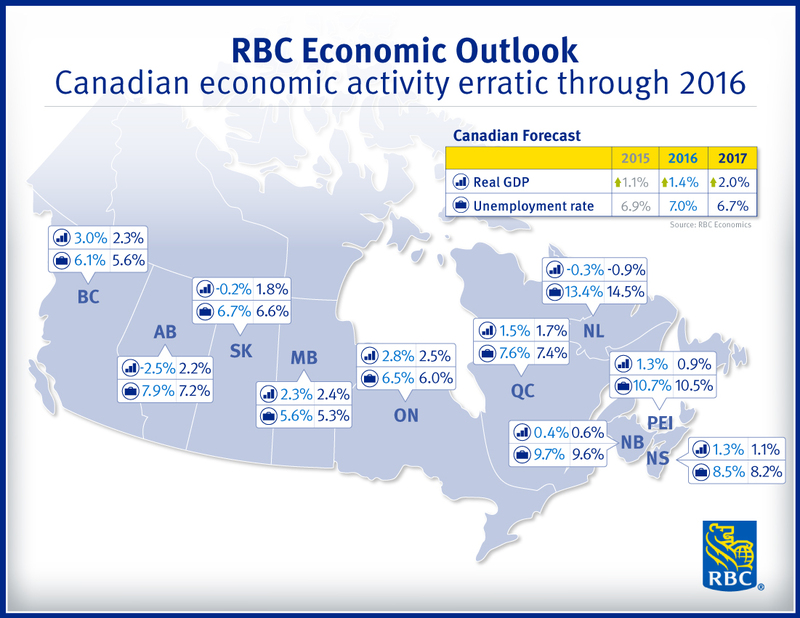 A separate RBC Economics Provincial Outlook assesses the provinces according to economic growth, employment growth, unemployment rates, retail sales, housing starts and consumer price indices. A summary of each province’s economic outlook can be found in this fact sheet.